The video shows an obsidian knife. 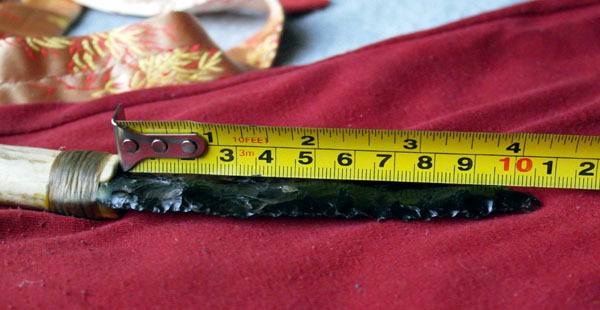 Contestants must estimate how long the obsidian blade is from the point it enters the handle to the tip. Entries must be in the form of millimetres. The prize is the knife shown in the video. 4. Entries must take the format of a length in millimetres. 5. Please read previous guesses before posting yours to avoid duplication. In the event of two people guessing the same length, and it is the winning guess, the member who posted the guess first will be deemed winner. 6. The non-busting guess closest to the actual length of the knife wins. 7. A pontoon rule is in effect, any guess longer than the knife's actual length busts and doesn't count [similar to card totalling over 21 in the card game pontoon]. For a guess to be legitimate it must be either the exact length of the knife of under. 10. Contestants who in this or previous contests opened multiple accounts to make several guesses are banned from this and all future competitions, any guesses they make will be ignored. 11. I will announce the winner in this thread. The winner has 14 days after the competition finishes to respond, if nothing is heard from the winner by then the prize will be offered to the runner up. Looks like it is just 'me and thee' Barnacle my friend. Ok here's the answer. I make it 108mm which means The Barnacle with a guess of 105mm is the winner, congrads. WoW Thanks Gren there is a knapping god - lol.